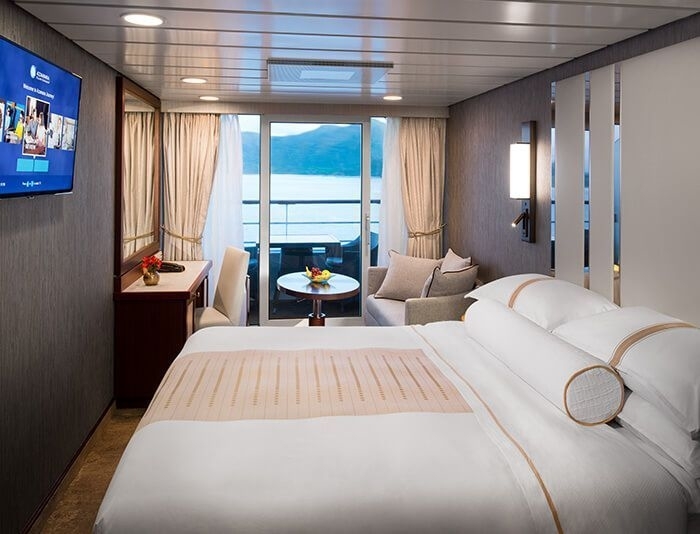 Sailing in from her previous assignment as Adonia under P&O Cruises, the new Azamara Pursuit will be completely refurbished with Azamara’s signature boutique hotel style ready for you to embark on her maiden season. She will be comparable in size to both Azamara Journey® and Azamara Quest®, so will allow you to visit unique ports that larger ships are unable to reach. Contemporary yet classic, stylish yet refined, on board you will find completely transformed staterooms and suites that are a feast for the senses. The boutique hotel-style accommodations are your home away from home when you travel with Azamara®, ensuring your stay is as comfortable as possible. Staying in a suite is like staying in your own holiday home complete with ocean views, sea breezes, and butler service. Relax with plush cotton robes and slippers, French bath products, fresh flowers, and fine linens. Open the sliding glass doors to your private veranda, perfect for reading, al fresco dining, or stargazing. Enjoy a drink from complimentary bottles of speciality spirits, mixers included. And should you need anything, your English-trained butler is never more than a call away. At Azamara Club Cruises they take you to remarkable destinations. They also give you more time to fall in love with them. It’s what they call Destination Immersion®—stay longer, experience more on their voyages. More time to get to know the local life and culture in every port. After all, isn’t that what travel is all about? But Destination Immersion isn’t just something that happens on shore. It happens onboard, too. What does that mean for dining onboard? They have incorporated the flavours of a destination into their menus. What does that mean for you? A culinary experience that is exclusive. Personalized. And very local. It’s time to get a real taste for travel. Discover the world through dishes and flavours from the places you visit. Whether it’s their Destination Immersion dinner buffet or the Destination Immersion cuisine on the dinner menu, give your dining a little local flavour and enjoy on shore tastes on board! Of course, you will also enjoy a wide variety of nightly selections such as filet mignon with black truffle sauce. With its elegant yet lively dining and renewed décor, it’s easy to see why this restaurant is a hands-down favourite, the culinary heart of the ship. Gather at Discoveries Bar for drinks before or after dinner. Steaks cooked to perfection. Crab cakes with remoulade. Lobster bisque. Lamb, game hens and seafood. And last but certainly not least, their famous mini cinnamon-sugar donuts with dipping sauces for dessert. (Yes, they are as good as they sound.) But at Prime C, you’re in for more than an array of delectable dining. Expect a marvellous evening in a warm wood-panelled ambiance with stunning views and lush décor. And, if the chef has made a visit to a local market while you’re in port, you’ll also have an authentic local dish to look forward to, made just for you.